For those who haven’t tasted queso fresco cheese, it is like the Mexican version of ricotta but with a creamy, salty tang. Made from cow’s milk, it is typically used to finish soups, tacos or enchiladas and is one of my favorite cheeses. Serve the Corn & Queso Fresco Cheese Spread with grilled bread slices, or grilled tortillas (cut into wedges after grilled) or your favorite tortillas chips. 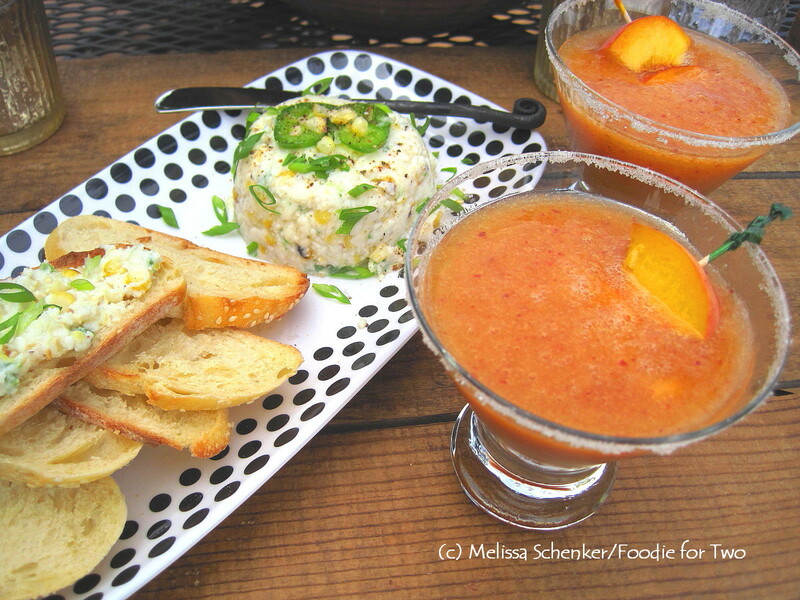 So there you have it, two easy ways to enjoy fresh corn and peaches! To the blender, add 3 cups of ice and finely chop. If your blender has an “ice” setting, use it to finely chop the ice. Add the chopped peaches, 1 tablespoon of sugar, rum and 2 cups of ice. Using the “chop” or “puree” setting, blend until the ice is well chopped and ingredients are well incorporated. Taste and if needed, add more sugar or more ice if mixture is too thin. Daiquiri’s can be made 1 to 2 hours ahead of time; keep daiquiri mixture cold in the refrigerator or freezer and re-blend before serving. Serve with a garnish of peach slices on a skewer or toothpick. Heat grill to medium. Remove the husk and silk from the corn, brush the cob with olive oil (or vegetable oil) and lightly season with salt and pepper. Place the corn cob directly on the grill and cook for 3 to 5 minutes, turning corn often, until corn has slightly softened and grill marks appear. Remove from grill and let cool. When cool, remove kernels from cob: place cob lengthwise on cutting board and using a long knife, slice kernels off one side, turn cob 90 degrees and continue. In a medium bowl, add the cheese and break up with a fork. Add 2 tablespoon milk and mix well until cheese is smooth and mostly lump-free; add more milk if too thick. Add the corn kernels, jalapeño and pinch of salt and pepper and mix well. Garnish with a few slices of jalapeño, some corn kernels, sliced green onions and some sea salt and fresh ground pepper. Serve with your choice of grilled or toasted bread slices, grilled tortilla wedges or your favorite tortilla chips. This entry was posted in Appetizer, Cocktail and tagged Corn, Dark Rum, Jalapeño, Olathe CO, Palisade CO, Peaches, Queso Fresco cheese. Bookmark the permalink. Thanks for stopping by and for sharing the love with a link on your site! Your blog is a refreshing and inspiring reminder to get out and travel, and savor the memories. These sound great! Love your serving plate. Someone who has good taste gave that to me for my photo shoots. 🙂 It has come in handy to add some szoosh to my food styling! When it’s pouring rain in Amsterdam, colorful foods like these make things feel and a taste a bit more like July should! Thanks to “My Love Affair with the Vine” (http://myloveaffairwiththevine.wordpress.com)… another great blog to check out! Yes, this combo would be great to enjoy pool side. Thanks for the shout out on your always entertaining wine blog!